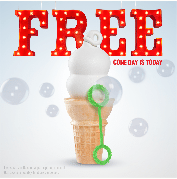 Today is Free Cone Day at Dairy Queen! – Dairy Queen Corp.
Today, Monday, March 20, Dairy Queen locations across the nation will celebrate the first day of spring with their annual Free Cone Day. Customers who visit a participating non-mall Dairy Queen location will receive a free small soft serve cone just for coming in. Some locations will use the opportunity to raise critical funds for Children’s Miracle Network Hospitals and their local children’s hospital in honor of Children’s Hospitals Week. Donations will be accepted throughout the day. Last year, more than $200,000 was raised for Children’s Miracle Network Hospitals on Free Cone Day! To find a participating location, visit www.DairyQueen.com/locator. Over the past 32 years, Dairy Queen has raised more than $120 million for Children’s Miracle Network Hospitals. Thanks Dairy Queen for making miracles every day. Comments for Today is Free Cone Day at Dairy Queen! Previous post: Dairy Queen's Free Cone Day!